Terry Laauli Fanolua was born in Moto’otua on the South Pacific island of Samoa on 03/07/1974 and is the cousin of former Gloucester and Western Samoa international Junior Paramore. Fanolua was 23 and playing club rugby for the successful Auckland based Otahuhu club when the then head coach Richard Hill and former club chairman Tom Walkinshaw persuaded him to sign for Gloucester before the start of the 1997/1998 season, and as a result he became one of the first overseas players in the Premiership alongside Philippe Saint-Andre from France and Richard Tombs from Australia. Fanolua made his Gloucester debut against local rivals Bristol at Kingsholm on 23/08/1997 in the opening Allied Dunbar Premiership fixture of the season, starting at outside centre, a position he went on to make his own. During this early period at the club he formed a formidable centre partnership with Richard Tombs as Gloucester embraced the professional era. He proved his skill and versatility by playing in every position across the back line except scrum-half at some point during his long and distinguished carrer at the club. Voted Shedheads’ player of the year in his first season, which is voted for by readers of the Gloucester fanzine Shedheads, it was immediately clear the fans were warming to his physical and uncompromising approach. Fanolua started and scored a try in the 33-25 Cheltenham and Gloucester Cup Final victory over Bedford at Franklins Gardens on 08/03/1998, after scoring 2 hatricks on route to the final against Fylde and Leicester. The following season he injured his medial ligaments during the Tetley’s Bitter Cup semi final defeat to eventual winners Wasps at Loftus Road, forcing him to miss another Cheltenham & Gloucester Cup Final victory over Bedford at Franklins Gardens the following week. During the semi-final victory over Sale, Fanolua played for most of the second half at flanker, further demonstrating his versatility and physicality. The 2001/2002 season provided another opportunity for Fanolua to lift some silverware as he proved a key figure in helping Gloucester to finish third in the Zurich Premiership table before starting in the 28-23 playoff final victory over Bristol Shoguns at Twickenham, earning the club a wildcard European qualification after Leicester finished top as champions. These were proving to be fruitful times at Gloucester and in 2003 Fanolua started in the 40-22 Powergen Cup final victory over Northampton at Twickenham, a competition the club hadn’t won since they shared the trophy with Moseley in 1982 after a 12-12 draw in the final. By the end of the 2002/2003 season he had helped the club to finish 15 points clear at the top of the Zurich Premiership table for the first time since the league structure had been introduced in 1987/1988 and thereby reach the inaugural Championship final. However, under the new league system Gloucester were rewarded with a 3 week lay-off, while their opponents Wasps played regular rugby during this period in order to qualify for the final at Twickenham. As a result, they lost their momentum and the table topping Gloucester team that included Fanolua could do nothing to prevent an emphatic 39-3 defeat. 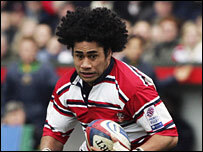 In June 2004 Fanolua signed a new 3 year deal with Gloucester, which would keep him at the club until 2007, exactly 10 years since he signed. Once again Fanolua was an ever-present in the Gloucester side during 2004/2005 season until a restrictive back injury reduced his effectiveness towards the end of the campaign, coming off the bench in the Zurich Premiership Wildcard final defeat to Saracens at Twickenham who claimed the last Heineken Cup place as a result. An injury to his right knee picked up during the final stages of his summer involvement with the Samoan national squad restricted him to just 10 league appearances during the 2005/2006 season and caused him to miss the European Challenge Cup Final victory over Northampton. After 9 years at the club Fanolua left Gloucester at the end of the 2005/2006 campaign aged 31 to join French club Brive, signing a two year contract after agreeing with head coach Dean Ryan he would not see out the final year of his current deal. Gloucester’s final Guinness Premiership home game of that season against Wasps was dedicated to Fanolua and named ‘Fanolua’s Farewell’, such was the impact he had made at the club, cultivating cult hero status amongst its fans. Upon leaving he was the club’s leading Premiership try scorer with 38 and had made 152 Premiership appearances, more than any other Gloucester player at that time. In total, Cherry and Whites legend Fanolua made 228 appearances and scored 60 tries tries in all competitions during his nine years at Kingsholm. Since leaving Gloucester he has maintained a close relationship with the club, returning on several occasions to play in charity matches at Kingsholm, and before the start of the 2012/2013 season new Director of Rugby Nigel Davies invited Fanolua back to give a motivational speech to the Gloucester squad about what it means to play for the club and represent the city, due to the manner in which he had served Gloucester with total dedication and utter distinction. Fanolua spent two seasons playing for Brive in the French top flight before leaving in 2008 and has since played for and coached the Bugue Athletic Club located in the Dordogne and Soyaux Angouleme Charente who are based in Angouleme. Fanolua’s international rugby career began when he was selected to play for the Samoa Sevens team, who he went on to captain. His first cap for the full Samoan national side came as a substitute against New Zealand in Napier on 07/06/1996, which they lost 51-10. He was a member of the 1999 and 2003 Samoan World Cup squads, playing 2 games in 1999 and three games in 2003, injuring himself in the pool game gainst England, which forced him to miss the following match against South Africa. He went on to gain 29 caps for his country scoring 7 tries, with his final cap coming in a 2007 Rugby World Cup qualifier against Fiji in Suva on 30/07/2005, which Samoa lost 21-15.